The Doctor’s House is a delightfully intimate venue, nestled in the charming small town of Kleinburg Village Northwest of Toronto. The bride gets ready by this creamy grey contemporary room, fully lit by its tall french windows and soft wall sconce, despite a cloudy day. From the gorgeous cream lace dress, to the coral and mustard yellow florals, to the vintage Hollywood-style wavy hair, every detail plays in perfect harmony. These grand french windows and creamy walls really highlight the beautiful bride and her bridesmaids. 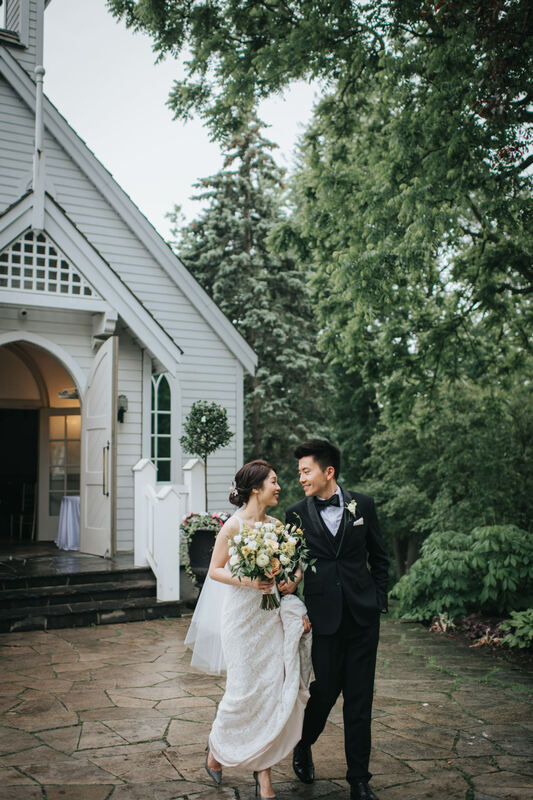 The sweet first look unfolds down a romantic walkway by the chapel, where the couple couldn’t even attempt to hide their excitement. BTW, you might even recognize the bride and groom from this exquisite destination engagement shoot in Kyoto, Japan! Can we talk about this intimate chapel made of ivory wood panels and coffee painted doors?! This makes the epitome of our philosophy: purposefully place every element in the right place to architect the perfect shot. Clean lines, soft minimal colour palette, intentional near focus greenery framing, and balanced lighting – simply divine. The rich wooden gazebo is another favourite in this set, it really brings out the warm, earthy tones of the bridesmaids’ velvety green dresses. It was starting to drizzle a bit by this time but you can hardly notice in these shots as the lighting was actually quite magical.